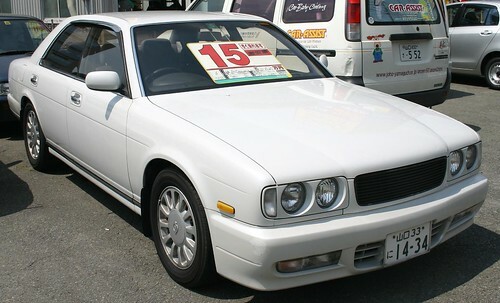 Large second hand cars in Japan are cheap. This Nissan Gloria had 80,000 kilometers on the clock and should run for as much again but it has a price tag of a mere 1500 USD. The Japanese are very environmentally conscious in some ways. There is a lot of recycling, use of renewable sources of energy such as wind and solar power, investment in energy saving technology such as hybrid cards, very economical cars, use of traditional energy saving devices such as heated coffee tables, bed warmers, and taps that allow one to wash ones hands with the water that fills the toilet cistern. But one area in which the Japanese do not excel is that of using second hand products. Second hand products are seeing a considerable increase in popularity at the moment, but until a few years ago there were very few second hand clothes and appliance stores. The prices of second hand cars was low. And the "large rubbish" days when Japanese threw away television sets, bicycles and other items that might otherwise find their way to a second hand store were a bonanza of perfectly usable stuff but those that carted it away were often gaijin. The Japanese seem to feel that second hand goods are in some sense dirty and thus defiled. Perhaps it is the shinto influence. I wonder if Shinto shrines could team up with second hand stores to offer purified (oharai sumi) second hand goods.